A male Orca travels through the waters off Northern Vancouver Island in British Columbia, Canada at sunset. The mist from the blow hole of this male Orca turns an incredible shade of pink as the sun begins to set off Northern Vancouver Island in British Columbia, Canada. The pinkish color gives a clearer definition of the outline of the mist from this male Orca which almost makes it look like mystical shapes. 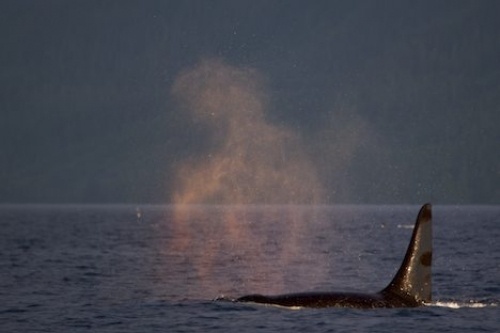 The sun also makes the water glisten on this growing male Orca's dorsal fin as the sun reflects a shiny glow to this black section of his body. The rays of the sun make the scars and markings on his dorsal fin much more prominent so you could get a clear view of who this male Orca is and which pod he belongs with. A couple of family members that belong in the same pod as this male Orca are not far off in the waters behind him. Family members of a pod do not tend to stray too far from each other and they pay close attention to what the matriarch is doing and what calls she makes.